I wanted to make a longer comic this time so I could get all the arguing out of the way in one fell swoop. Plus, more Robespierre. Coming up, Edison has a drink, and everyone calms down. It’s all smooth sailing from here on in…or is it? Stick around! UPDATE: You no longer have to log in to leave a comment. Now you, and you, and especially you, can just drop a line. By the way, I really appreciate your comments. Especially yours. Just enough to take the irritation away…she promises. Which brings up something that I mentioned to a fellow creator in Facebook: the “drunk bubbles” that hover around Edison. I’ve worked out a system: 2 bubbles and she’s almost sober-sober enough to be irritable. 3 is her comfort zone. 4, she’s drunk. 5, she’s really drunk. 6, she’s probably unconscious. And I still come down on Larry’s side of the subject at hand. I just wouldn’t be so loud about it. I can see why Edison gets irritable, even if I disagree with her. But hey, there’s always Stephanie and Robspierre. I feel a new dynamic duo in the making. That moment of eye contact is priceless. Thanks. I was afraid that I had drawn him/her/it so small that it wouldn’t be noticed. I looked up Robespierre’s debut (Page 97 “SURFARI SO GOOD”, and noticed something interesting. It was right around that time that commenting picked up from scarce to frequent. Coincidence? I think not! Anyway, I think it’s time to come clean about Robespierre. Like many children, he/she/it was an accident. When I was peniclling SURFARI SO GOOD, Edison was supposed to be holding up some noodles. Then she would’ve been dropping a handful of noodles down Larry’s back. Now he’s one of the most popular characters in the strip, and he has an important part to play in future events. Plus, he’s cute. And that’s how legends are born. Or 6 legged (armed?) li’l stinkers, anyway. Hexatentacular cephalopoid. Some of the best inspirations throughout history have been unpremeditated. Still working on it. I have someone who could make them, and I have to show her Robespierre. I hope to have a couple finished in time for Emerald City Comic Con. Cos He/She/It looks kinda scared, little and alone. My favorite Robespierre Moment is in the first panel here. I don’t think I noticed (or at least, thought about) the comment she makes about her husband “getting that look” if she mentioned the babysitter. We still don’t really know that couples’ story or why Edison began drinking to begin with. Not fully, anyway. It’s possible he’s not the only victim (aside from the boy, of course). It was a fairly innocent “guys like girls kissing girls” kind of thing. And yes, not all the story has been told. Or rather, only Edison’s version has been. Am I bad to hope that Anya actually gets parental consent to have a relationship with Jacob? It’s not ideal, but at least it would be legal, and it might actually be a good thing all around. By the way, I am loving that handsome devil with the R on his best. He looks so familiar. Well, it’s just to get her to stop being irritated, so they could have a conversation. That would be an option, of course. It’ll depend on what Reverend Dubblleman’s like. Francesca probably wouldn’t care one way or another. Ain’t he a looker? I was going to put him in a tee-shirt with the R on it, but then I got an Archie vibe, and went with the sweater and shirt. He cleans up quite well. No longer have to log in? THAT’S a relief – I forgot mine a while back – yes, I know it would have been recoverable – I uh, forgot that too…. Hey, if disabling login gets returning commenters (you, you, and YOU) back, it’s worth any trouble. Welcome back! Looks like Robespierre is doing a pretty fair Cerebus impression in the first panel. Li’l guys is trying to talk to the bug on his-tentacle? Good call on the Cerebus! I’m so glad you’re caught up! I know how long it can take to get caught up on an established comic. I hope it’s been worth it. And don’t worry about the book-most people say it doesn’t make sense until the second time you read i-I mean, I carefully crafted it so that you’ll get more out of it with each re-reading! Gosh, I hadn’t heard of Barefootz in a long time! I think there’s a lot of 70s comics swirling around in my brain when I draw. 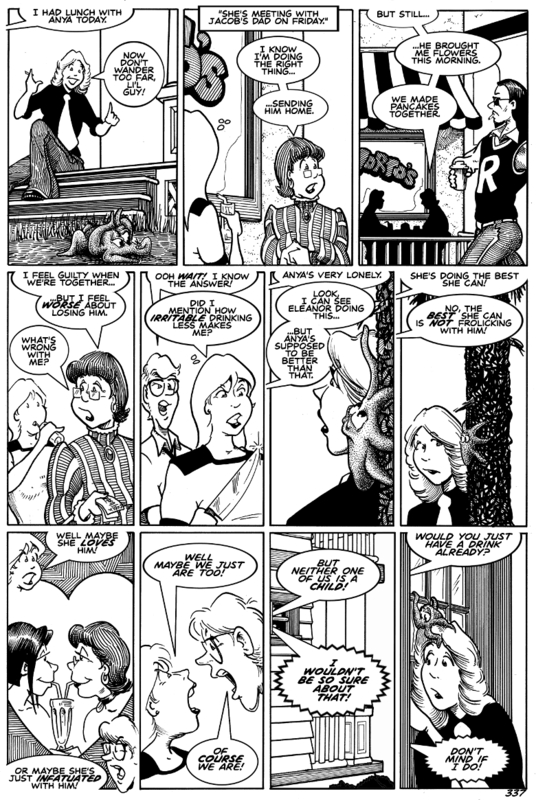 Journey, Megaton Man, Love and Rockets, Meef, Fabulous Furry Freak Brothers-all that great black and white stuff from the 60s through the 80s. In addition to GK, I’ve done some furry stuff for Shanda the Panda, and two “adult” comics for Xxxenophile Presents. Oh, and thanks for reminding me to break out my Toonerville Trolley collection again! Toonerville Trolley…now i have to see if i even have a collection. I was always more of a Smokey Stover, Krazy Kat, Little Nemo and Bringing up Father kinda guy. Sometimes i just long to be back in the ’70s again, but we all had different problems back then. Thank you Charlie for taking the time to put down on paper and share the lives of these wonderful folks that we have come to care about so much. Apparently I’ve got a copy of the only collection of Toonerville Trolleys out there. Perks of owning a bookstore. If you find one, pick it up. It’s great stuff. I will admit that I’ve never formed the love for Krazy Kat that everyone tells me I should. I have a bunch of collections at the store. They say you just have to read enough of them till your brain gets warped that way, and then they’re genius. I’ll let you know. And Night Gallery is well worth the revisit. Especially Season 2. That last panel was like a punch to the face. Well done and keep up the good work.